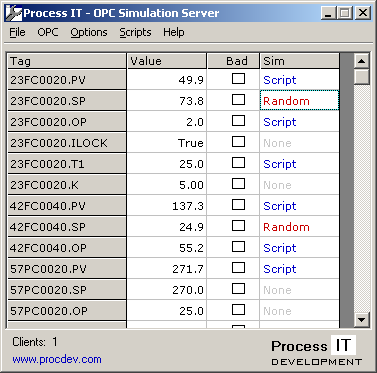 The Process IT Development OPC Simulation Server is a tool for simulation and testing of OPC client applications. The OPC Simulation Server allows the user to define an OPC tag database using a comma separated (CSV) file, and to simulate a process by changing tag values. The user can set the quality of a tag to Bad via the Bad check boxes, or can change the simulation mode for each OPC tag with the Sim combo boxes. An overall master switch for the simulation is turned on or off using the Simulate dropdown from the Options menu. 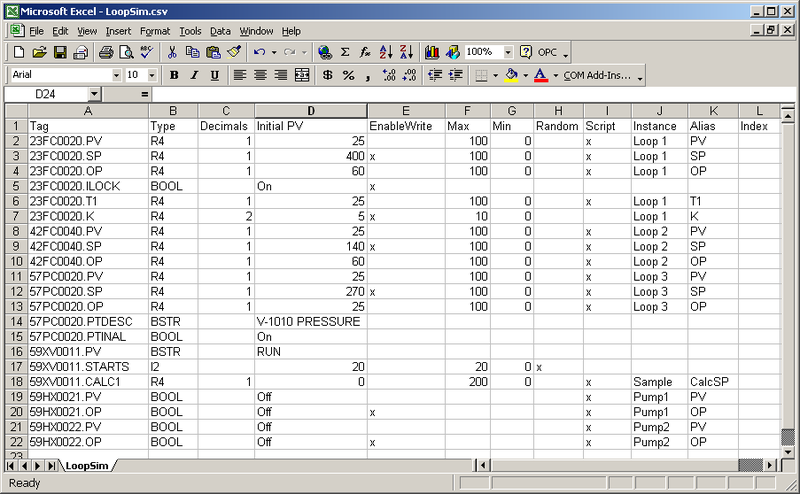 The OPC Simulation Server is configured using an INI file and a CSV file. The license key for the OPC server is a string in the configuration INI file, and is based on the machine name. Anything other than a valid string (for example LicenseKey=Demo) is treated as a demo license. The simulation will time out after 30 minutes for a demo license, although the OPC server itself will still allow manual entry of tag data. The OPC server allows more than one simulation configuration to be specified in the INI file, although only one of these configurations will be used. This is the ActiveConfig. This is the overall simulation On/Off switch that can be used to enable or disable simulation for all data items. The simulation switch can be set on from the main menu of the OPC Sim Server. This directive specifies the number of scripts for a simulation, e.g. Scripts=1. If the simulation does not use scripts, set Scripts=0 or omit the directive. For each script, this gives the entry point (or Main) subroutine for the file. For each script, this specifies the execution interval in seconds. The default is 1 second. The operation of the OPC Simulation Server is relatively straightforward. At startup, the OPC tags are assigned the values in the Initial PV column of the database CSV file. VB Script can be used to read and write values in the OPC server. This allows the user to customise the simulation to their requirements. The value of the tag is varied between the maximum and minimum values specified in the database CSV file. The demo version supports a maximum of 30 simulated tags, and the simulation features time out after 30 minutes. The OPC Simulation Server can be licensed for a nominal fee - see below. The OPC values can be set manually by simply typing in a new value. Individual items may be given a Bad status by ticking the Bad checkbox. The default is that the tags in the OPC server are read-only. To permit an OPC client to write to a tag in the OPC server, make an entry in the EnableWrite column of the database CSV file. Note that this requirement to enable writes only applies to the OPC interface - it is always possible to manually enter a value into the OPC server. Through the use of VB Script, the OPC Simulation server allows the user to simulate a process in a simple yet powerful manner. AliasVal(strInstance, strAlias) This get/set property allows each OPC tag to be referenced using an instance and alias. The instance and alias names are specified in the OPC tag definition CSV file. This approach makes it easy to write generic subroutines for simulating process components such as a PID loop or a motor. For example, the following sample code could be used in a subroutine, where strLoop, the name of the instance, has been passed as an argument to the subroutine. IAliasVal(strInstance, strAlias, nIndex) This is similar to AliasVal, but in addition it allows the OPC tags to be indexed. The index is specified in the OPC tag definition CSV file. For example, the following script updates an array of tags referenced as "NN". This fragment of code would typically form part of a subroutine, where strArray would be an argument to the subroutine. The OPC Simulation Server is available as a Microsoft Installer package: Download.